Our lab investigates the biology of long non-coding RNAs, particularly in the context of neurodegeneration, microglia, and neurogenesis. What are long non-coding RNAs? Long non-coding RNAs (lncRNAs) are a novel and fascinating family of molecules that exert a large number of crucial cellular functions, particularly in the context of gene expression regulation. They do not encode for proteins but act primarily as functional RNA molecules. Importantly, they appear to act in a very tissue-specific manner and the brain contains a large number of them. As the lncRNA field is still emerging, we and others are just beginning to understand their biological roles and molecular mechanisms of action in more detail. LncRNAs have also been implicated in a large number of human diseases and represent promising therapeutic targets, yet to date the field has very limited knowledge of their contribution to pathogenic pathways. For these reasons we expect that the investigation of lncRNAs will lead to new and exciting concepts in basic biology as well as in the treatment of human disease. 1) LncRNAs in neurodegeneration: Neurodegenerative diseases such as Alzheimer’s disease are extremely common in countries with a high life expectancy such as Europe and the US, and they have a very severe impact on the life of patients and their families. Decades of research efforts have been directed at deciphering the underlying disease mechanisms, yet the therapeutic toolset available for treatment is extremely limited. First pilot studies show that lncRNAs are likely to contribute to neurodegenerative disease pathways, and we are currently undertaking systematic efforts to identify and functionally characterize disease-associated lncRNAs from patient material and animal models. 2) LncRNAs in microglia: Microglia are the immune cells of the brain and recently turned out to be at the heart of neurodegenerative disease progression for their ability to both promote and limit neurotoxicity and neuronal degeneration. Their activities are thus under heavy investigation as potential drug targets. One of our current research programs investigates how lncRNAs impact on microglial functions, both under healthy as well as disease conditions. 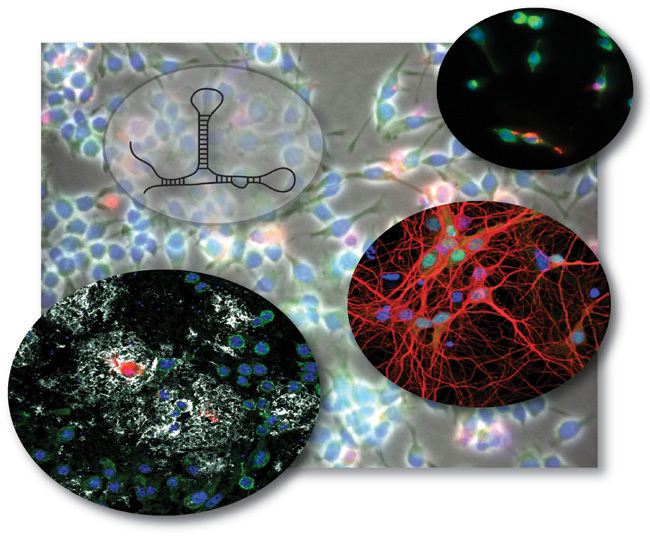 3) LncRNAs in neurogenesis: LncRNAs are emerging as important regulators of neural cell fate and initial findings suggest that they mediate developmental transitions during the differentiation of stem cells and neural precursor cells to neurons, astrocytes, and oligodendrocytes. The lab uses a combined approach involving genetics, ex vivo models, stem cell based differentiation assays, biochemistry, gene expression analyses, and advanced imaging methods to dissect the biological and molecular function of lncRNAs contributing to neurogenic pathways.